A man wades through flooded streets during a No. 10 Hurricane Signal raised for Typhoon Mangkhut in Hong Kong on Sunday. Residents walk on flooded streets as typhoon Mangkhut batters their city on Sept. 15 in Tuguegarao, Philippines. 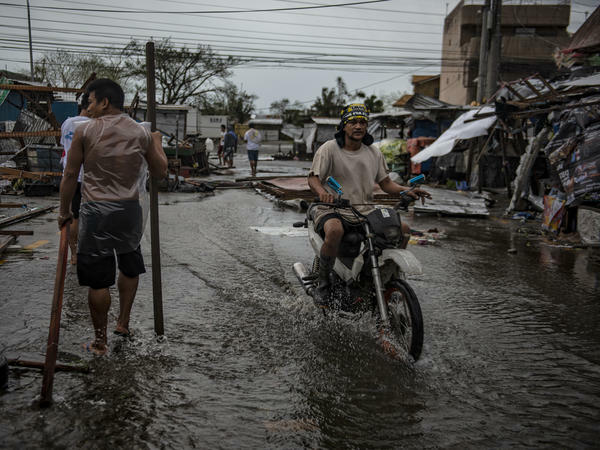 Typhoon Mangkhut hammered northern Philippines as it made landfall Saturday morning leaving at least 12 people dead. 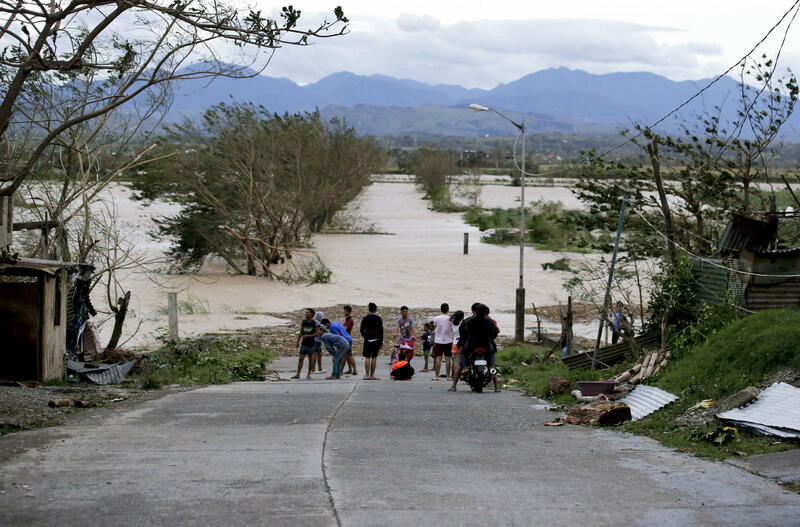 Residents stand by a flooded road following the onslaught of Typhoon Mangkhut in Tuguegarao city in Cagayan province, northeastern Philippines, on Sept. 15. It was in the Philippines, however, where the most deaths — at least 28 — have so far been reported. As NPR's Julie McCarthy reports from Manila, the storm knocked out power, cut telephone lines, and triggered landslides and storm surges. But, she said, "a thorough assessment of the damage is all but impossible because of all the inclement weather this storm has pulled in its wake." The federal Hong Kong Observatory had upgraded the storm's rating to a Number 10, indicating that residents should expect wind speeds at hurricane levels or faster. Officials expected water levels to rise in Hong Kong's Victoria Harbor and warned residents to take shelter. At about 4 a.m. local time Sunday morning, the Joint Typhoon Warning Center of the U.S. Navy measured the storm's sustained winds at just above 100 mph as it headed towards Hong Kong. The center had forecast maximum sustained winds at just over 90 mph through Sunday; wind speeds are predicted to dissipate as the storm continues moving over land. Formerly classified as a super typhoon, Mangkhut is known as Ompong in the Philippines — as McCarthy reports, the government gives it a "Filipino cast" to engage the public. The ferocious storm arrived in the Philippines at around 1:30 a.m. local time on Saturday, with sustained winds of over 120 mph. It was downgraded to the equivalent of a Category 4 hurricane after it made landfall, according to The Associated Press. It struck northern Luzon, the biggest island in the Philippines, a terrain home to over half of the country's population featuring both mountains and farmland. As rain fell nonstop for hours, the country's rice-producing region was flooded. The Red Cross predicted before Mangkhut's landfall that it will destroy 1 million tons of rice. Reuters reports 42 landslides throughout the country — some deadly. Philippine National Police Chief Oscar Albayalde tells The Associated Press that 28 people have died, many because of landslides. Twenty of those were in Cordillera, a large northern region on Luzon. The National Defense Office has confirmed two deaths to NPR: Two rescuers were killed in a landslide in a mountainous region. The agency is also investigating more reports, including three more who have allegedly died in a separate landslide and four cases of missing persons. Historically, typhoons of this magnitude generate hundreds, sometimes thousands of deaths. Super Typhoon Haiyan — a more powerful storm than Mangkhut — killed more than 6,000 people in the Philippines in 2013. Officials were worried that Mangkhut could be just as catastrophic. "We really learned a lot from the Haiyan experience," Catherine Cabarles, a school teacher in Quezon City, told NPR before Mangkhut arrived. "After that Haiyan experience ... many of us are evacuating to higher places." Before the storm made landfall, Civil Defense used that knowledge to pre-position hundreds of thousands of food packs. Police were deployed near the impact zone to prevent looting, and armed forces prepared to take the lead on search and rescues. More than 4 million people in the Philippines were declared at risk from the storm, and around 87,000 evacuated, with 105,000 staying in temporary shelters, according to Reuters. Communication is cut from many areas and high winds are hindering responders, meaning it's too early for a full assessment of damage. "In a storm this intense it's difficult to imagine that more damage isn't out there," NPR's McCarthy said. 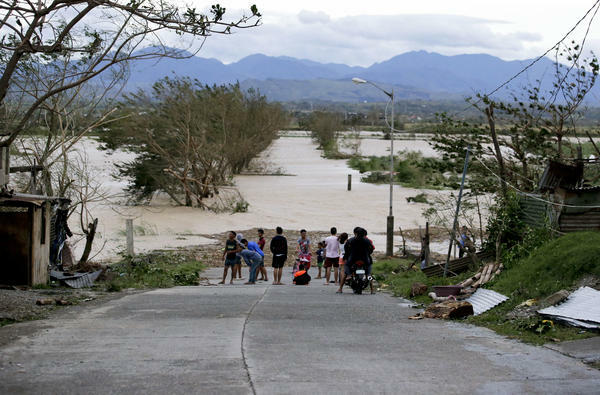 "The poor families living in [the Northern Philippines] have less capacity to recover quickly," Jerome Balinton, a Humanitarian Response Officer with Save the Children in Santiago City, told NPR. "They are not well-equipped to immediately cover, for example, the need for shelter repair, the need to replace their household essentials." "The schools will definitely be affected," Balinton said. "If these schools or communities don't have enough capacity to immediately repair their school infrastructure or replace the teaching and learning materials, surely the typhoon will cause a long-term impact to children's access to education." 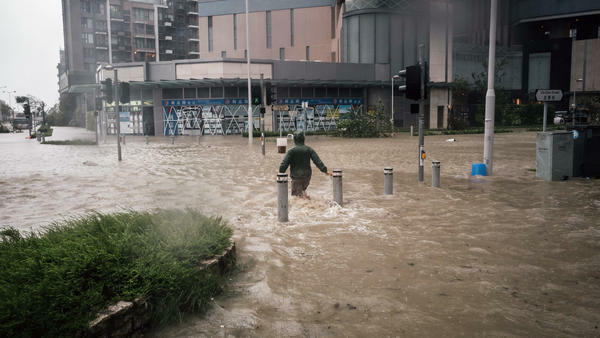 As Hong Kong had braced for impact, many businesses and homes were shuttered, nuclear power plants in the storm's path were "in combat readiness" and hundreds of flights from the Hong Kong International Airport were canceled, according to the South China Morning Post. The Post also reports Hong Kong's Civil Aid Service has deployed staff to "help residents take precautions" and appeal to those in the most risky areas to evacuate.